In your 20s, the horizon seems limitless. You’re in your first grown-up job, making a regular paycheck. You may be tempted to spend it on fun stuff. But here are four areas that should take priority. Pay off credit card debt. If you carry a hefty monthly balance, or are just paying the minimum interest, stop. Credit card interest can be 18% or more, which will derail your savings plan if left unchecked. Paying off your balance each month to dodge interest charges is a no-brainer. Build an emergency fund. Maybe it’s a brake job for your car. Or it could be more serious, such as an underinsured illness. Experts recommend squirreling away six to eight months of cash to cover essentials, such as rent, food, transportation, taxes and utilities. 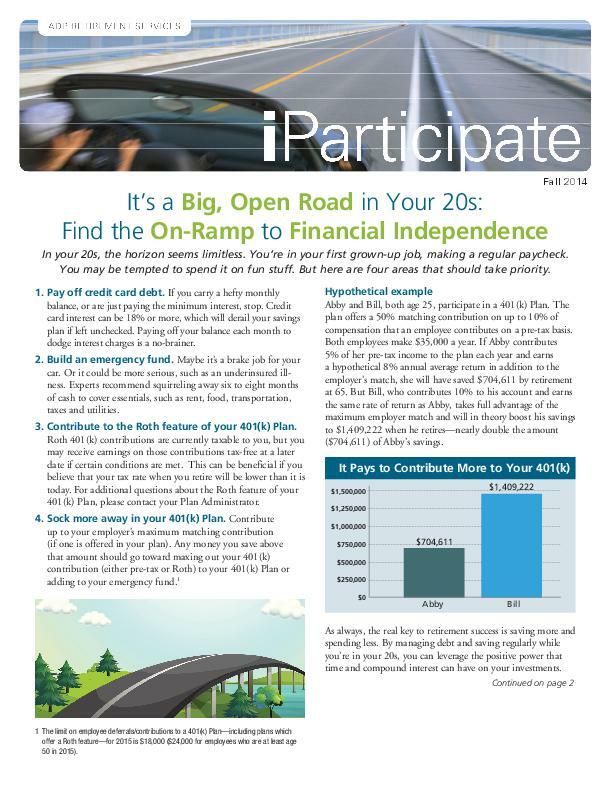 Contribute to the Roth feature of your 401(k) Plan. Roth 401(k) contributions are currently taxable to you, but you may receive earnings on those contributions tax-free at a later date if certain conditions are met. This can be beneficial if you believe that your tax rate when you retire will be lower than it is today. For additional questions about the Roth feature of your 401(k) Plan, please contact your Plan Administrator. Abby and Bill, both age 25, participate in a 401(k) Plan. The plan offers a 50% matching contribution on up to 10% of compensation that an employee contributes on a pre-tax basis. Both employees make $35,000 a year. If Abby contributes 5% of her pre-tax income to the plan each year and earns a hypothetical 8% annual average return in addition to the employer’s match, she will have saved $704,611 by retirement at 65. 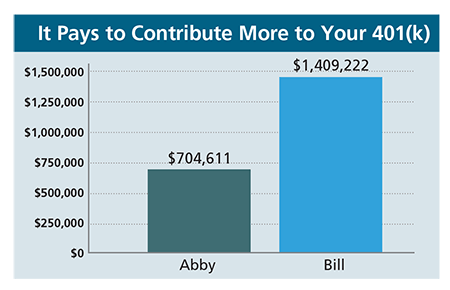 But Bill, who contributes 10% to his account and earns the same rate of return as Abby, takes full advantage of the maximum employer match and will in theory boost his savings to $1,409,222 when he retires — nearly double the amount ($704,611) of Abby’s savings. As always, the real key to retirement success is saving more and spending less. By managing debt and saving regularly while you’re in your 20s, you can leverage the positive power that time and compound interest can have on your investments. Some investors who lack the time or interest to invest on their own may benefit from a “do it for me” approach. Some plans offer the option to invest through an advised separately managed account (SMA), a custom portfolio that reflects your specific circumstances and goals. With more flexibility and investment choices, an SMA allows you to work closely with a financial advisor to create a portfolio that’s matched more directly toyour needs. 1. The limit on employee deferrals/contributions to a 401(k) Plan—including plans which offer a Roth feature—for 2015 is $18,000 ($24,000 for employees who are at least age 50 in 2015).